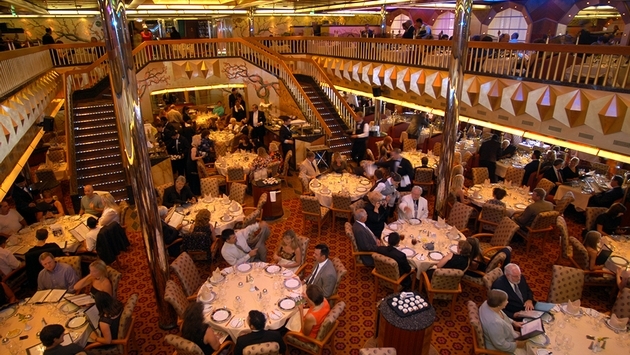 PHOTO: The dining room aboard the Carnival Glory, the first ship to test the cruise line's new menu program. With so much attention focused on specialty restaurants on cruise ships in recent years, Carnival Cruise Lines has turned its sights on improving the main dining room experience. The Fun Ship line is testing a new restaurant-style concept, first on Carnival Glory starting Dec. 8 and then on Carnival Liberty beginning in January, and Carnival Imagination and Carnival Inspiration starting in February. The new concept is called American Table and American Feast, with the former offering a “modern restaurant experience” on Cruise Casual nights and the latter serving the fancier meals guests once or twice per voyage on Cruise Elegant nights. The change starts with the waiter being able to offer cocktails and wine without having to flag down the bar server. A new cocktail menu will offer drink specialties such as the Raspberry Mojito and the Carnival Cosmo, as well as wines by the glass and bottle. The American Table menu is divided into several sections that always appear, although the individual selections vary. The appetizers section features individual selections — perhaps seared tuna, roasted broccoli salad and vegetable spring rolls — as well as some larger plates — such as fried calamari or flatbread with caramelized onions and mushrooms — designed to be shared by the table, the way most people eat them. An appetizer section called “Rare Finds” offers unusual options, such as Spicy Alligator Fritters and Frog Legs Provencal with Herb Butter. On the current menus, this section is called “Didja” as in “did you ever … food you always wanted to try, but did not dare.” “Our guests tell us they don’t always like the food, but they like to try it,” Tamis said. The “Mains” section of the menu offers five entreés, including one vegetarian, as well as a section called “From The Grill” that serves selections such as free-range chicken breast, flatiron steak port chop, salmon fillet or pork chop. “We’ll always have a fish, steak, chicken and a different protein like a pork chop,” Tamis said. The grilled entrées are served with a choice of sauces, including chimichurri, barbecue, béarnaise, peppercorn, roasted garlic and tomato tapenade. Also new is the “Port of Call” menu. “One thing the guests told us is they like the idea of having some of the food from where we’re visiting,” Tamis said. The “Port of Call” section offers a cocktail, appetizer and main dish from various ports. For example, the St. Thomas menu includes a cocktail made with Bacardi rum, pineapple juice, coconut and orange juice, followed by a tropical salad with lettuce, raisins, coconut, chili, almonds and cilantro lime dressing. West Indian chickpea and chicken curry is the entrée. Now guests can choose the side dishes they want with their entrée. They’ll also change from day to day but might include a loaded double-baked potato, macaroni and cheese, mesclun green salad or basmati rice pilaf. American Feast menus, served during the dress-up nights, will include entrées such as prime rib, broiled Maine lobster and miso-marinated salmon filet. 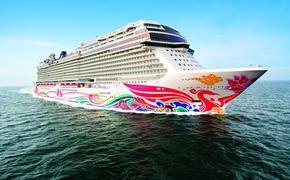 Carnival plans to roll out the new dining program fleetwide, but is starting on four ships. So why did Carnival undertake this major menu change?